They're the biggest band you've never heard of but, as Roz Laws found out, the Wiggles enjoy a cult following that's not confined to the kids. They&apos;re the biggest band you&apos;ve never heard of but, as Roz Laws found out, the Wiggles enjoy a cult following that&apos;s not confined to the kids. They have both sold millions of CDs over decades of success – but only one holds the record of selling out Madison Square Gardens for 12 nights in a row. Not even Elton John, who is appearing at the LG Arena at the NEC, can claim that. But just across the city, four men in bright turtle neck jumpers will be delighting hundreds of excited under-fives, as they perform their hits like Big Red Car and Hot Potato. 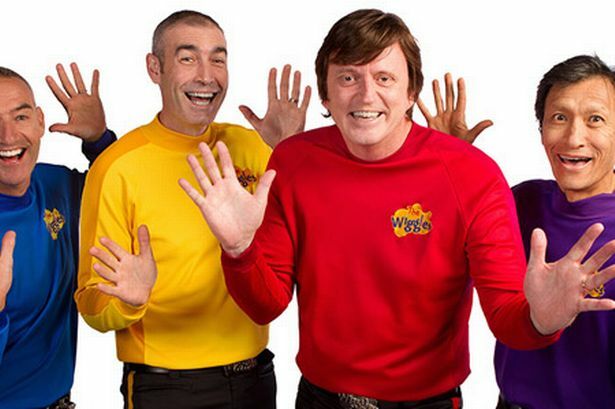 The Wiggles are playing the Alexandra Theatre on June 15. And now that Sir Elton has a child of his own, 18-month-old Zachary, he might just be popping in before his own show to see the group in action. Elton certainly wouldn’t be the first celebrity fan of The Wiggles, probably the world’s most successful children’s entertainers. Other admirers of the Australian band include Robert de Niro, John Travolta, Sarah Jessica Parker, Metallica and Jerry Seinfeld. They have duetted with Kylie Minogue, while Coldplay – Chris Martin and Gwyneth Paltrow’s children are fans – sang one of their hits, Fruit Salad, at a gig in Sydney. “When people you admire – like de Niro, for heaven’s sake! – come to your show, it’s bizarre and thrilling,” says Greg. The Fab Four for the under-fives are celebrating their 21st year in showbusiness, and the return of Greg to the band – but only briefly, as this is the final tour of The Wiggles as we know them. Greg, 40, Is a founder member, having met Anthony Field (Blue Wiggle), Murray Cook (Red) and Jeff Fatt (Purple) while studying education at university in Sydney. But after 15 years, he was forced to leave because of ill-health. He suffered from a series of dizzy spells and passed out. His heart was racing, he was breathless and trembling, with symptoms of fatigue and slurred speech. It was three years and 60 different tests before he was finally diagnosed with orthostatic intolerance, a malfunction of the nervous system which causes a delay in adequate blood supply to the brain. Now, after six years away from The Wiggles, Greg feels well enough to rejoin them for one last farewell tour. “It was worrying when I didn’t know what was wrong with me,” he confides. “I went to the doctors numerous times and they tested everything. At one point, a doctor told me I might have a disorder that would kill me in seven years – that was terrifying. But eventually they diagnosed me and put me on medication, which I no longer need. I know how to manage my illness now. “I’ve been back on the road for a while and I haven’t had any problems. The shows are tiring and I want to sit down when I finish, but then all the blood pools in my legs and I feel unwell. “So I make sure I get up and walk around. The worst thing is to sit down for a long time. But doesn’t he feel at all annoyed that the band have decided to call it a day, just as he has rejoined them? Murray, Jeff and Greg are handing over their jumpers to a new younger set of Wiggles, who are joining Anthony on stage next year. Greg has six children in all – two grown-up from his first marriage, two step-children and two with second wife Vanessa. Lara is two and Cameron is 10 months. “Lara only knew me as Dad before, but now she watches TV and calls me Greg when she talks about The Wiggles. After 15 years singing the same songs, doesn’t Greg ever get bored of repeating lyrics like ‘Toot toot, chugga chugga, big red car’? Even if such songs reportedly earn them £28 million a year. “I still absolutely love singing the songs, I never get tired of them,” he insists. “I’m really proud of what The Wiggles have done. Yes, we are well-paid, but the money isn’t something we have focused on. The only reason why it’s important is so we can put it back in the business and keep it a good quality experience. “We’ve worked very hard and take it very seriously. We care about good entertainment for kids.We have always been self-funded. We own everything ourselves, so we don’t need to bow down to anyone else’s idea of what The Wiggles should be about. It was seven years before we got our own TV show, so by them we knew what we wanted to do. It’s not just children who enjoy The Wiggles’ shows, as the fan letters – some of them rather racy from enamoured mums – prove.